This bourbon peach cobbler simply screams summer. From the juicy, ripe, summer peaches, to the indulgent biscuit topping, this cobbler has earned it’s place at your next backyard get together. Take it to a summer potluck, neighborhood block party, or serve it at a family celebration. Top yours with vanilla ice cream, or get fancy and try it with my Maple Bourbon Whipped Cream for a truly decadent treat. Hi! I’m Renee, the recipe developer and food photographer behind Renee Nicole’s Kitchen where I help make home cooks into home chefs. I create approachable, homemade, gourmet recipes that focus on educating my readers and advancing their culinary skills. 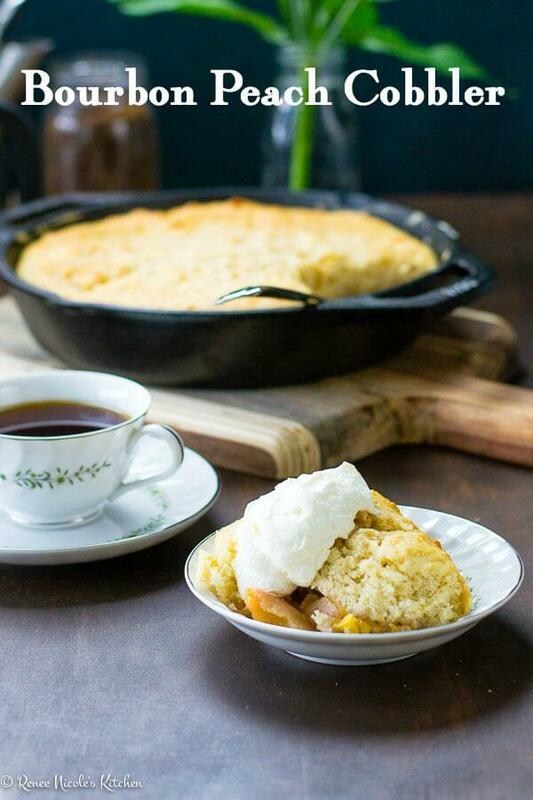 I am so excited to be here today sharing my recipe for Bourbon Peach Cobbler. Being raised in Kentucky, I know a thing or two about bourbon. One of them being how well the flavors of bourbon meld with fresh peaches and brown sugar, the basis for this delightful summer cobbler. 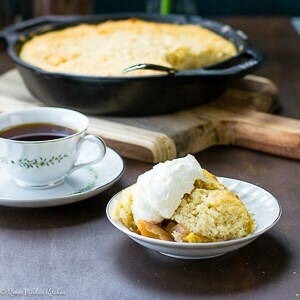 Whether you are looking for a party perfect treat for a gathering with friends or a dessert fit for a Sunday family meal, this old fashioned Peach Cobbler recipe has you covered. Read on for my tips and tricks to get it right the first time, or jump straight to the recipe and get baking. With warm breezes blowing through open windows, long sunny days, and impromptu weekend getaways, there are many things to love about summer. The world is filled with life, color, and delicious fresh summer produce, like these juicy sweet peaches. Today we are taking those fresh peaches and turning them into a delicious bourbon peach cobbler. This version is a bit different than my Bourbon Apple Crumble. Besides one being a crumble and the other a cobbler, the main difference is that the peaches this time of year are juicy enough to make their own sauce, which means you can cut out a step and still get great results. It comes together quickly and has a flavor that just screams summer. Next time you need a dessert that will keep them coming back for more, load up on some ripe, summer, peaches and try your hand at making this bourbon peach cobbler from scratch. Fresh, ripe peaches give this peach cobbler lots of juicy flavor. This recipe was designed for fresh peaches. That said, it works with both fresh and frozen peaches of all kinds. You can use white or yellow peaches. Little peaches, big peaches, or the short flat ones commonly known as Saturn peaches. You could even use nectarines, or as I used to refer to them: naked peaches. 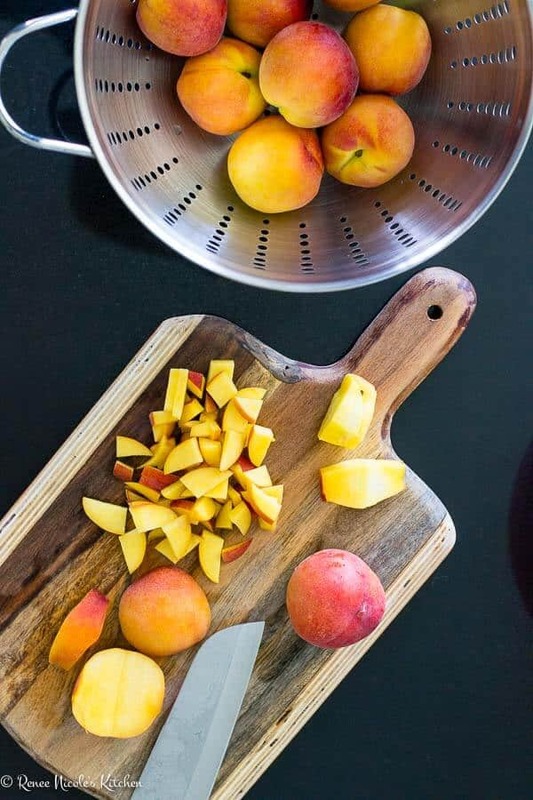 If you can find freestone peaches, they are easier to slice up for a cobbler than cling peaches. Those peach types get their names from how the fruit does or doesn’t connect to the pit as it grows. Freestone peach have a stone that will be attached by a few strings, but for the most part the stone is free from the flesh of the fruit. Cling peaches are the ones where the flesh of the peach is clinging to the stone. If you use this kind, you’ll need to slice around the pit (like you would for a mango) before slicing. they should be free from any obvious blemishes. If your peaches are firm, let them sit out at room temperature for a couple of days to continue to ripen. If your peaches are soft, fragrant, and ready to use before you need them, store them in the crisper section of your refrigerator to extend their life by a couple of days. If you peaches have blemishes or bad spot, just cut that part out before the throwing the rest of the peach into the cobbler. When it comes to cooking with alcohol I have one main rule: if you wouldn’t drink it, don’t put it in your food. That includes the bourbon in this cobbler. For this recipe we use 1 tablespoon, which is half an ounce, and about 1/3 of a serving. It’s okay to sacrifice a little bit of your favorite bourbon to make this delicious cobbler. If you don’t keep bourbon on hand and aren’t inclined to go out and buy a bottle just for this recipe, don’t. Use genuine vanilla extract. Like most bourbon, it has an alcohol content of 35% and all the flavor to go with it. Many of the vanilla extracts you’ll find in baking shops will be labeled as “bourbon vanilla extract.” That’s how you know you’ve got the good stuff. A little goes a long way and you can find cheaper options at Trader Joe’s, World Market, or Home Goods. If you are someone who avoids alcohol all together, I’m glad you stuck around this far into the story! I will point out that by the time you mix the bourbon or vanilla into this crumble, bake it, and share it, the actual alcohol percentage is next to non-existent. That said, they do make imitation vanilla extract. It’s artificial flavoring and can be found next to the real stuff in the baking aisle. The Three C’s: Crumble. Crisp. Cobbler. Do you know the differences between crumbles, crisps, and cobblers? All three of these varieties are all fruit based desserts, and while they are similar to pie they take a lot less effort. The difference is in the toppings and one is only better than the other based on your personal preference. Crisps are the most basic and typically involve a crumb topping make of dried oats, brown sugar, and cold butter. The topping crisps up as it bakes, giving it it’s name and resulting in a crunchy texture that plays against the soft fruit. Crumbles take a crisp topping (oats, brown sugar, and cold butter) and add flour to it. This gives a softer result, with a little bit of crunch. It’s easier than making a cobbler, but a little richer than a crisp. It’s similar to the streusel topping you’d find on my blueberry muffins or a Dutch Apple Pie. Cobblers, my personal favorite, are topped with a sweet, cake-like, biscuit topping. They are arguably the most indulgent, but I say if you are going to eat dessert you should be indulging! 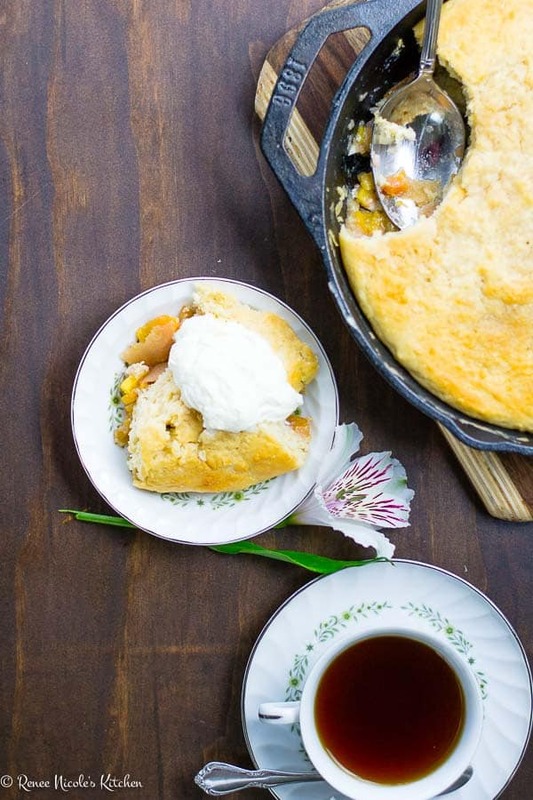 Baking this peach cobbler in an iron skillet makes ALL the difference! This recipe is easy. A new cook with some baking experience should be able to make this peach cobbler. A few notes about this recipe. Peaches come in all sizes, so I shared the measurement by weight, volume, and count. Measure them on a scale at the grocery before you get them home, then chop enough to make the 5 cups. It’s okay if the peaches are slightly over or under. The fruit portion of this cobbler is less scientific than the topping. Do not skip the sliced butter that goes on top of the peaches. In the oven it’s going to melt, mixing with the sugar and peach juice, and becoming the secret ingredient to our self-saucing peaches. The buttermilk adds acid, flavor, and texture. If you need a substitute, use 1 cup of whole milk with 1 tablespoon of lemon juice or vinegar. Low fat or fat free milk will result in a thinner batter. It can work, but this is dessert – it should be indulgent and that extra fat adds a richness that is unmatched by the fat free version. Be sure to make this peach cobbler recipe while summer peaches are at their best! 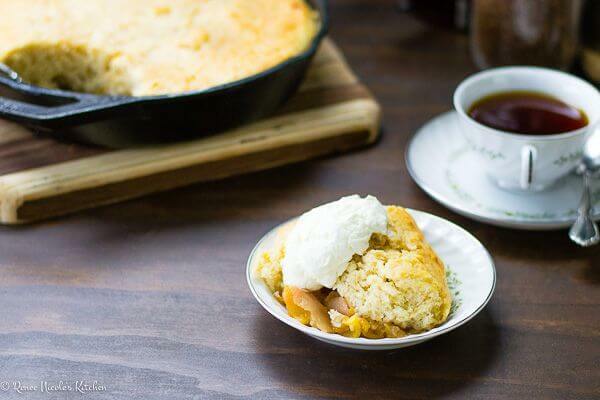 This southern bourbon peach cobbler is SO good. Just add a scoop of vanilla ice cream or a spoonful of whipped cream and you’re ready to go! If you love this recipe please give it 5 stars. This bourbon peach cobbler simply screams summer. From the juicy, ripe, summer peaches, to the indulgent biscuit topping, this cobbler has earned it's place at your next backyard get together. Take it to a summer potluck, neighborhood block party, or serve it at a family celebration. Top yours with vanilla ice cream, or get fancy and try it with my Maple Bourbon Whipped Cream for a truly decadent treat. Leftovers can be stored covered, in the fridge for 3 - 5 days. My mother always left her's on the countertop, but the topping gets soggy faster when stored at room temperature. Start with the peach filling. In a large bowl combine together the brown sugar, ground ginger, and cornstarch. Mix to combine. Slice peaches into bite sized pieces. Then toss with the brown sugar mixture to thoroughly coat. Add the bourbon, stir, and set aside. Moving on to the biscuit topping, in a medium sized mixing bowl combine together the flour, brown sugar, salt, baking powder, and baking soda. Whisk to combine and break up any clumps. Cut the cold butter into 8 - 1/2 tablespoon sized chunks. Crumble the cold butter into the flour mixture using a pastry cutter, or your hands, until the butter is in pea sized chunks. Add the buttermilk to the topping mixture and stir until just combined. It will be a thick, wet, heavy batter. Grab a 10" cast iron skillet or pie pan and lightly butter it. Stir the peaches then pour into the skillet. Slice the other 4 tablespoons of butter into 8 - 12 thin pats and spread them out on top of the peaches. Spoon and drop the biscuit dough on top of the peach filling, gently spreading it to fill in the gaps. Optional: Dust with 1 tsp of raw sugar for a pretty finish. Bake at 350 degrees for 40 - 50 minutes or until the filling is bubbling and the top is golden brown. Serve with bourbon whipped cream, ice cream, or no cream at all. Marye – Thank you so much for sharing my recipe! Looking at these photos makes me want to make it again for dessert this weekend! Oh Renee – it looks delicious! I cna’t wait to try it.